Just before the central ledges of Terrassen - the point where Rimmond and Swedish Route separate. The Swedish Route goes up right through the steep terrain of "Gråveggen" (Grey Wall) whereas Rimmond takes the obvious ramp of "Narrow Slab" up left. At this point we decided to change route to Rimmond. We were slow and as the terrasse was still blocked with ice we feared the upper part of the harder Swedish route would be iced up. It might be of interest to note that a very large part of the wall above Peter disappeared at a rockfall in the mid nineties. 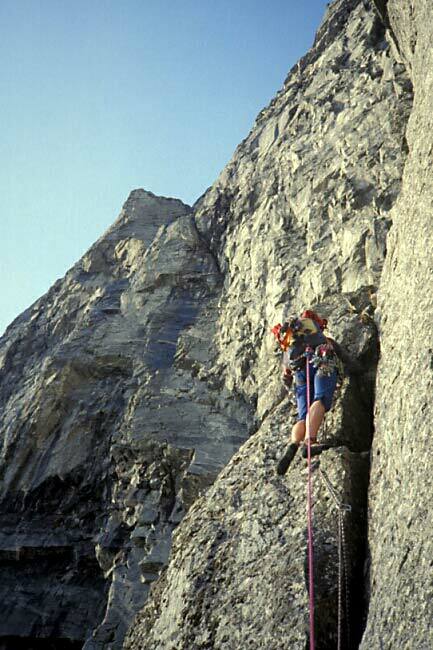 The rock fall changed both routes and kept climbers away for many years. See Bjarte Bø's website for updates and photos of the rock scar.